You Are Here: Home » Our Farm Animals, The Farm » Summer is just around the corner! Here we are, last week of May. All the goats that I had up for sale have sold. I have 2 little ones that are reserved & will be picked up June 12th. It’s so quiet at the barn now. When I wake up in the morning, the sense of urgency to feed the “starving” goats is no longer there. All you can hear now are the roosters trying to out do each other! Lets see, Sweety & her doeling Gracie, Annabelle & her doeling Pebbles, Molly the fainting goat, the wethers Bongo & Herman & our stud, Billy… that’s all that’s left as goats! To think that I had 16 or so kids in the month of April! Well, I sure am glad the “selling” experience is over! What a hassle that always is. I hope I remember this when I think about breeding the girls in November! The last 6 weeks or so has caused me to think about how things can get expensive when animals start needing veterinary care. 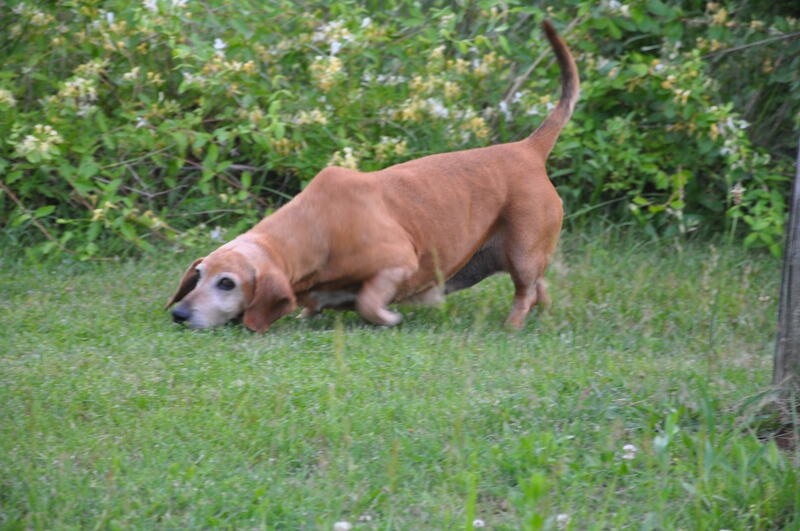 First it was Angel the pound hound that was diagnosed with Diabetes (I can write an entire post on that alone!) $500., then Major the Llama went down (he’s fine now… $295 later), then Gracie the goat & her C-Section $250 & lastly Mandy, the MinPin mix we adopted when my mother-in-law passed, $250…. those bills added real quickly! One fine day after spending over an hour cleaning up the Pot Bellys Dogloos I got to thinking about how much money was being spent on these 3 animals that I rarely saw! They’re were always sleeping somewhere & only came out to eat! Lulu was still totally wild althoug h I’d had her almost 3 years! Grumpy was okay & so was Ms Piggy but they just kind of hung together & stayed away from people. Then I quickly started to count feeding costs & realized I had spent at least $1200 on these 3 for the last 2 to 3 years! WOW.. rude awakening! So I found all three a good home together and since I had the perfect pig area, I went out and bought 2 “freezer” pigs. This brother (neutered) & sister pair are a Hampshire mixed breed that apparently are the best for this purpose. 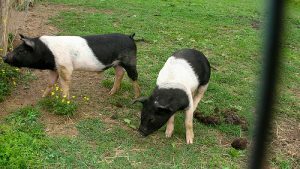 Scott named them Bacon & Pork Chops so that we never forget why we got them! I found that contrary to the Pot Bellys, these two are excellent swimmers and come out of their pasture via the pond. I’m still trying to reduce the number of animals but only if I can find excellent homes for them. For instance, I’d love to find a home for the 3 Llamas but only if they can go together to the same place for the last transition of their life. Otherwise, they’ll stay here and we’ll continue to care for them & enjoy them as the lawn ornaments they are. 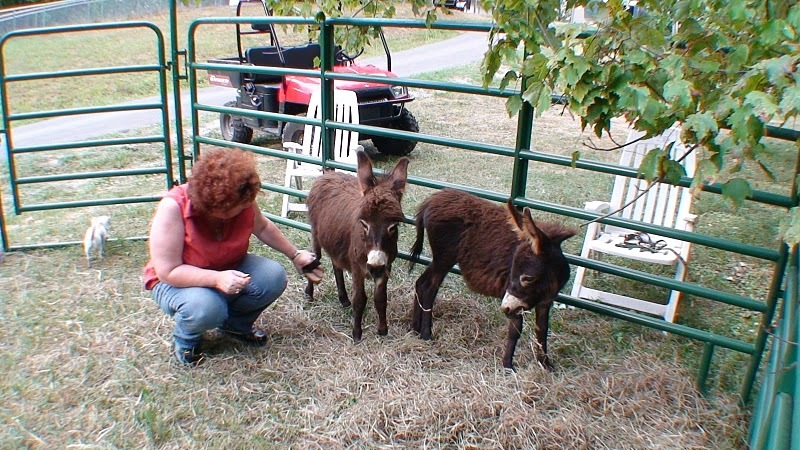 Same thing for Madigan & Daisy June, the miniature donkeys that we got in September ’07 (see picture). Because miniature donkeys here are almost a dime a dozen, its not easy to determine that a future home will be the last home. It would kill me to know these girls were separated! They’ve been together since birth and are almost 3 years old now! They’re at the perfect age to breed but once again I don’t want to get into babies anymore. I guess they’ll be here for a long time… I’m just not ready to take a chance that someone wouldn’t be as caring as I am. I almost sold the donkeys a year ago… then all of a sudden I started to wonder if they’d be alright, if the new owner would only keep one and sell the other.. it just broke my heart thinking of it! We had 2 duck hens hatch several eggs.. Sadly, from the first group, 6 ducklings got eaten by snapping turtles.. (which prompted hubby to acquire a 22 caliber rifle). Only one left in that little family. As for the other family, this mom is a little smarter & stays closer to home. 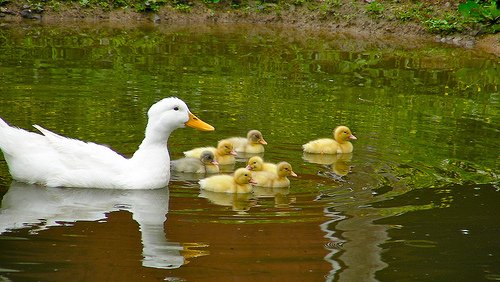 She still has 9 beautiful little ducklings following her everywhere! Our Banty Cochin hens have also been very busy! We have several families scratching around at the barn. They’re of different age groups and stay very close to mama hen. One of the clutches has a mama & a nanny! These 2 girls couldn’t decide who was going to hatch the clutch so they did it together. They too are a pleasure to watch! As for the miniature horses, they continue to be totally adorable. My guys are all very loving and good horses. Ol’Blue must be almost 25, Buddy the cremello gelding is about 4 or 5 & then Toffee the baby will be 2 in a few weeks. They get along great, they’re pretty good with the farrier & they’re beautiful to look at and enjoy. Scott & I get a lot of pleasure looking into the pasture and seeing Buddy chasing Toffee playfully and nipping at Blue on the way! The Llamas always look at the horses with an air of superiority! It’s a beautiful view from our porch! On a final note I have to add that people are funny… I just recently decided to post a “donate” button on my website because I was spending so much time answering emails & comments from my website. All proceeds will go to our local animal shelter.. not to me. In any case, since the appearance of the “donate” button, I’ve had not one single query & I had always had a few every day before that! Don’t you think people are funny? Have a good summer everyone & remember to always be kind to animals.. they too are God’s creatures & we’ve been entrusted by Him to always treat them with care & respect.